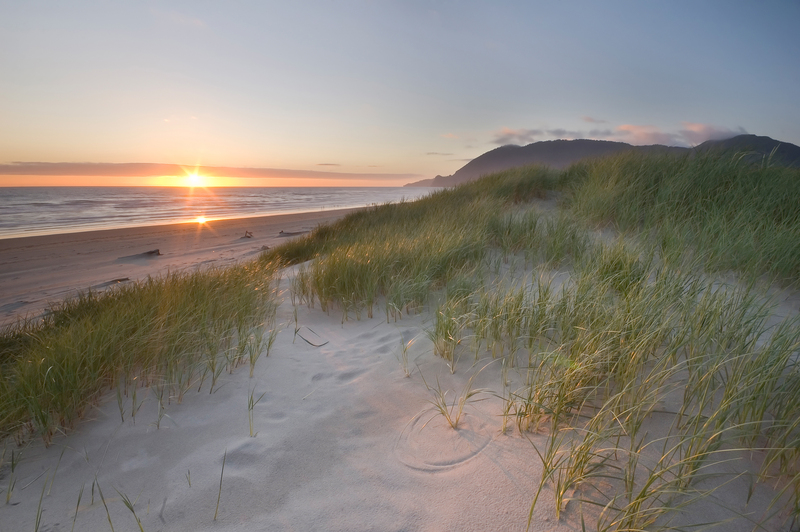 The Oregon coastline is famed for its strikingly beautiful scenery, gorgeous beaches, and breathtaking sunsets. One of the best ways to enjoy all these jaw-dropping wonders is by exploring the numerous state parks that dot the coast. With accommodations that range spartan to luxurious, each state park has its own unique feel and attributes. We’ve gathered a list of all that the Oregon State Park system has to offer along the Pacific Ocean. You’ll find plenty of inspiration here for your next road trip! At the far northern end of the Oregon coast sits Fort Stevens. From the Civil War to World War II, this historic fortress has been guarding the entrance to the Columbia River for an impressive number of years. Offering one of the nation’s largest campgrounds, sprawling military ruins and even an old shipwreck, there is something here for everyone in the family. Be sure to bring your bike to access the miles of bike paths that wind their way through this park. Biking is an easy way to avoid the fight for a parking spot at some of the more popular day use parking areas. For some of the best surfing Oregon has to offer, look no further than Oswald West State Park’s Short Sand Beach. With miles of hiking that encompasses the breathtaking views of Neahkahnie Mountain and Cape Falcon, you’ll be reaching for your camera at every turn. While previously a walk-in campground existed here, today that campground has been closed due to repeated hazards from falling trees. Abundant crabbing and fishing opportunities await at Nehalem Bay State Park. Seafood lovers can catch their own meal to enjoy as the sun goes down on 5.3 miles of scenic sand. Activities available include biking and horseback riding in addition to the recreational fishing. There is even a small airstrip for the well-heeled adventurous traveler. Well hidden off of Highway 101, Cape Lookout State Park offers a campground that is ideal for tent campers. As you may expect, this is a popular spot, especially in the crowded summer months. Over 5 miles of sandy beach are perfect for hunting seashells and building sand castles. The idyllic 2.4-mile stretch of trail out to the tip of Cape Lookout is sure to be a hit with the family. Less exposed hiking is also available through old-growth forest as well. Convenient day-use parking makes this a popular stop along the Oregon coast to get out of the car and stretch one’s legs. Iconic beach views are an easy walk here because there is a trail that leads under the highway. The campground is well known and loved, so reservations are highly recommended in the busier summer season. For nature lovers, the brief Spencer Creek Nature Trail provides a glimpse of old-growth Sitka spruce forest, a rare treat in a state known for its logging. Just south of Yaquina Bay Jetty in Central Oregon lies South Beach State Park. With 27 yurts available in its well-appointed campground, this park boasts more yurts than any state park in Oregon. These highly coveted camping retreats are hard to snag, however, so be sure to get your reservation in early here. In summer months (July 4 through Labor Day), kayak tours make for a wonderful outing at the nearby Beaver Creek State Natural Area. For reservations, check out the Oregon State Parks website. Formally Ona Beach and Beaver Creek State Natural Area, Brian Booth State Park offers a unique opportunity to explore marsh habitat chock full of wildlife. Stop by to inquire about the park and its resources with staff at the Beaver Creek Welcome Center. They can provide information for those wishing to explore the creek as well as any information about recent notable animal sightings. There is plenty here for the kids, so pencil in some time to explore and learn. For some of the best non-motorized access to the Oregon Dunes National Recreation Area, Honeyman State Park should be first on your list. Bring your sleds, your cardboard, or just your own two feet and enjoy some good sliding fun down these massive dunes. To rinse the sand off you, consider a dip in Cleawox Lake as a warmer alternative to the ocean waves. While the crowds can feel a tad overwhelming at times, if you put in a just a tiny bit of effort and walk a little further, you can find a quieter paradise for yourself. Also accessing the sprawling 31,500 acres of the Oregon Dunes National Recreation Area, this smaller state park is an excellent choice for longer coastal stays. You’ll be rewarded for your hard work if you manage to snag one of the deluxe yurts available here because the amenities they offer are particularly luxurious by coastal standards. With dunes, lakes, rivers, and a lighthouse to explore, there are plenty of ways to fill your days. Boasting the only public boat ramp on the popular Eel Lake makes this state park a draw for water lovers. Day use facilities are ample here, and there is plenty of space to accommodate the crowds in summer months. Swimming, fishing, and paddling on the lake make a nice alternative to the windswept beaches, especially when the fog rolls in. The inland nature of these waters makes them less prone to the chill gray that can sometimes envelop Oregon’s beaches. In the summer, there’s a tropic vibe that is hard to resist at Sunset Bay State Park. Practically a lagoon, the sparkling white sands of the crescent beach paired with bright blue waters make this a particularly appealing beach for families. Calm waters protected by the small opening to the ocean means even the little kids can enjoy a paddle in the water here. A nice day use area away from the beach offers volleyball nets, picnic tables, and horseshoe pits as well as group picnic spots. One of the most stunning parks in the system, an entire trip can easily be devoted to just this one state park. Humbling geology, the history of the Louis Simpson estate, sea cliffs, and a not-to-be-missed botanical garden are just some of the wonders to be found here. If you find yourself visiting in the winter months, a lighting display takes over the gardens creating a magical coastal scene. Pet owners should be aware, however, that dogs are not allowed out of cars, and the policy is strictly enforced. Please plan your trip accordingly. A cacophony of sea lions greets visitors at the viewpoint of Cape Arago State Park. With views of Coquille Point and Simpson Reef and Shell Island, you’ll definitely want your camera handy for this park. Divided into north and south sections, each piece has its own beauty to offer. The northern end emphasizes the breathtaking views, while the southern end highlights hiking and private coves. With picnic tables and a day-use area between the two sections, you can even find a protected spot for whale watching here. Unusually situated, Cape Blanco is the westernmost point of the state of Oregon and also has the southernmost lighthouse in the state. Remote in all aspects, it can be easy to whizz past this park due to the discreet signage off the highway. Because of its low-key advertising, Cape Blanco State Park tends to be a little quieter and less congested than other parks in the area, though camping can fill early during the summer months. Horse camping is available here as well as rustic cabins. With trails straight from the campground, this park makes a wonderful base camp for your travels. Despite limited hours, the museum at Port Orford Heads State Park is a must-visit. Here you’ll have an opportunity to learn about the hardworking, risk-taking lifeboat crews that once manned this station. Anyone who has witnessed an Oregon coast storm can appreciate the dangers these men faced. The fishermen and sailors that plied the waters here depended on the bravery of these crews. After you’ve absorbed the history, take in a walk along the Port Orford Heads State Park Trails to really grasp the grand scale of the land at work here. Nestled in along Highway 101, Humbug Mountain State Park Campground is a fantastic wooded retreat for explorers of the southern Oregon coast. Naturally protected from the wilder elements by Humbug Mountain, this campground can be a great spot to ride out unexpected storms. Beach access directly from the camping areas is an added plus. The only downside to the small campground is the occasional road noise that can be heard wafting in from the nearby highway. A newly created park, Sisters Rock was funded using state lottery money and officially made a state park in 2005. The park is still being developed and is relatively unsigned on the highway, so it sees significantly fewer visitors than most other parks in the area. Two beaches stretch out on either side of a steep peninsula here. With no facilities yet present, this is a wilder park made wilder still by the rusty remnants of an old gold prospecting community from the 1800s. You probably won’t find gold here yourself, but that’s okay because the real treasure lies in the solitude and wild roughness this park holds for its few visitors.